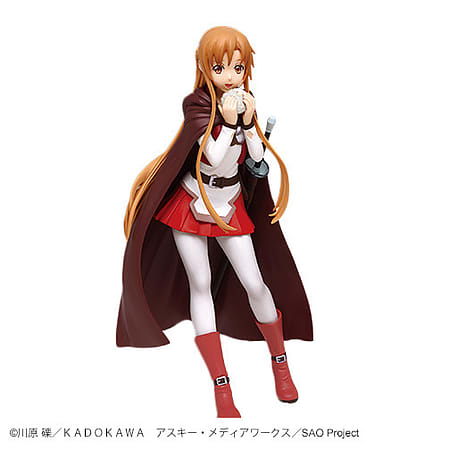 This figure shows Asuna in her original Fencer starting gear she wore when she first met Kirito, wearing a dark red leather tunic with a lightweight copper breastplate and leather pants with boots up to the knees along with a hooded cape. From the popular anime Sword Art Online, Taito presents a brand new figure of the main heroine Asuna! This figure shows Asuna in her original Fencer starting gear she wore when she first met Kirito. Wearing a dark red leather tunic with a lightweight copper breastplate and leather pants with boots up to the knees along with a hooded cape. Posed while eating a small piece of bread, this figure faithfully recreates Asuna as she appeared at the start of Sword Art Online prior to joining the Knights of the Blood Oath.